On our way from Venice to Florence, we could not pass up a stop through Bologna. We have heard the rumors that Bologna had “the best food in Italy” (as if there was anywhere in Italy that had the worst food? Sorry, not possible!) so we just knew that we needed to have lunch in this infamous city. After an extremely stressful drive through the city center of Bologna where there was no indicators of what was considered a real street, ya know…for cars…and a street that was only for pedestrians. I don’t know about you, but I call those sidewalks. Apparently in Bologna, streets…sidewalks…same thing. Anyways, we finally found a parking spot and reapplied our deodorant (because the stress sweats of almost running over multiple humans got the best of us) and made our way to find somewhere delicious to eat in the food capital of Italy. Literally steps from our car, we came across “Osteria Dell’Orsa“ and from one quick look at the menu and a gander inside, we were sold. We took a seat at a communal table next to some college students enjoying a break between classes, a huge plate of cured meats and glasses of wine. From where we sat, we could see directly into the kitchen where the chef was taking charge, calling out orders and stirring the bathtub size pot of ragu simmering away on the stove. We could see the simplicity of the service – take order, bring food, have fun, and smile. The smells were intoxicating and we couldn’t help but order a bottle of Lambrusco made locally to celebrate our great find. The special of the day: tagliatelle w/ bolognese (get it? Bologna = bolognese) for €6. Can you believe that? So cheap! Our budget friendly brains and rumbling stomachs just could not pass that deal up. But first, a simple crostini to start. We ordered the Saraceno which was a crostini topped with melted mozzerella, Parmesan, fresh tomatoes, olive oil and oregano. I burnt my tongue on the melty cheese because I just couldn’t help myself. The simple ingredients that all came together in a melty mess is what made it delicious. And then in the window to our right, we saw it: the tagliatelle with bolognese so nicely split between 2 bowls for us. I made eye contact with the chef as he dished it up and I probably looked like predator eyeing her prey. So creepy. But then I came to my senses and gave him a smile, not a death stare. 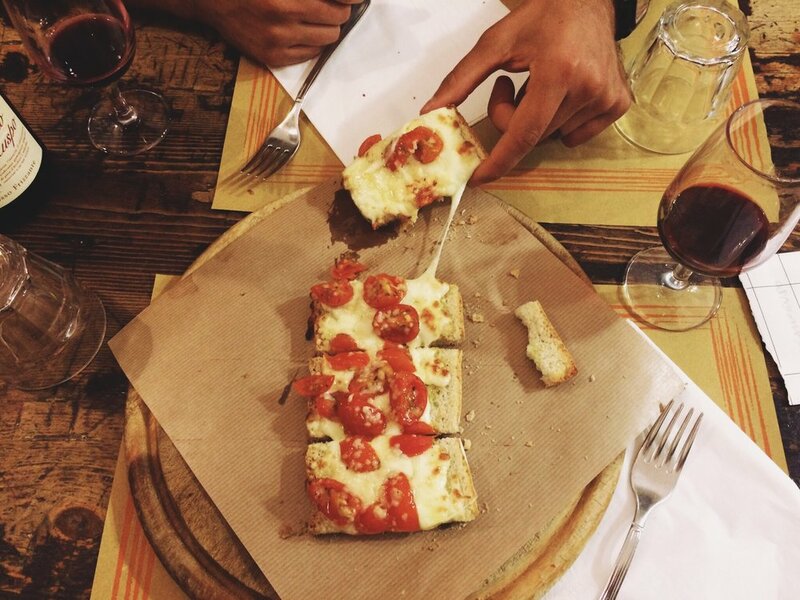 A little sprinkle of Parmesan cheese and we conquered – yes, Bologna has AMAZING food. 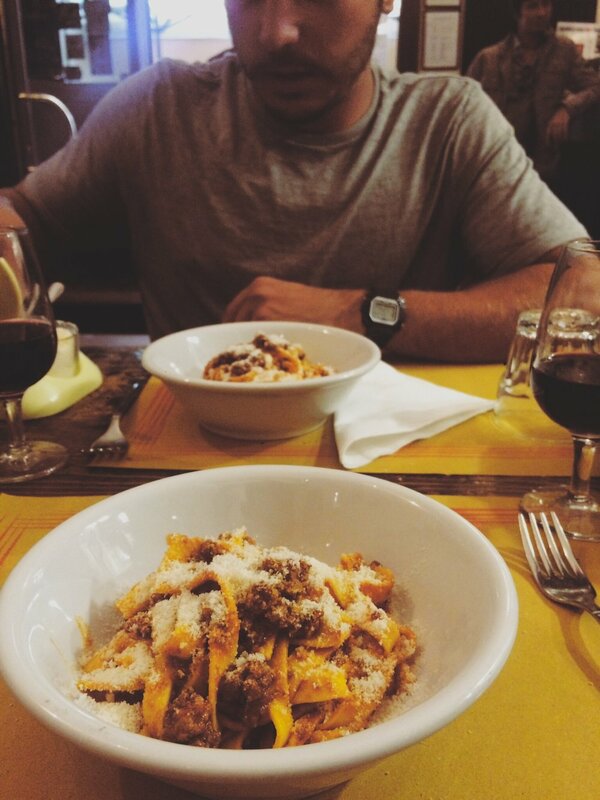 The freshly made pasta, the hearty ragu, the sweet Lambrusco and the wonderful service all made for an incredible meal. How much did our meal cost for a bottle of vino, an appetizer and a big plate of pasta? A whopping €22. A meal like that would have easily cost much more back home! We left the restaurant feeling like we had robbed this little gem. Conclusion: good food that is made fresh will always have more flavor and not leave you feeling weighed down, Lambrusco is the perfect lunch wine, simplicity is key, make sweet eyes at the chef and he might throw a little more sauce on your steaming plate of pasta and never pass up an opportunity to stop in Bologna for lunch. Newer PostWeek 7: Goodbye, Italy. Hello from France + Spain!